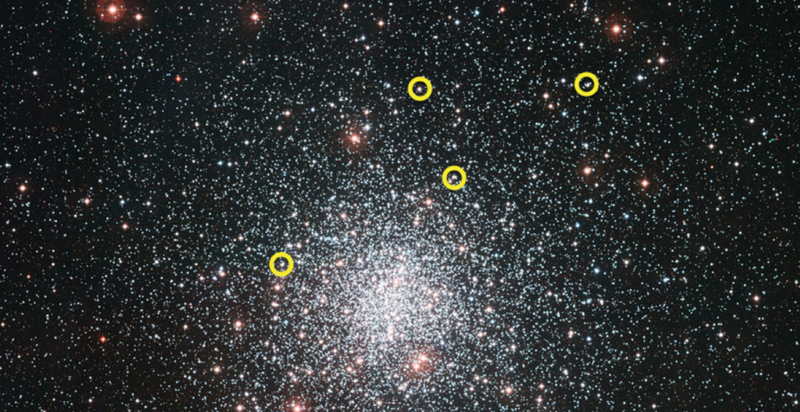 An international group of astrophysicists from the universities of Birmingham, Aarhus, Paris, Padua, San Diego and from Mt Stromlo Observatory in Australia have captured the sounds of some of the oldest stars in our galaxy, the Milky Way, according to research published June 7, 2016 in the Royal Astronomical Society journal Monthly Notices. On this animation it is possible to listen to the stars if you position the cursor on the circles. The real oscillations are beyond the normal human hearing range, but here they have been transformed into something audible. The research team, lead by Andrea Miglio from University of Birmingham’s School of Physics and Astronomy and Stellar Astrophysics Centre, Aarhus University, has reported the detection of resonant acoustic oscillations of stars in ‘M4’, one of the oldest known clusters of stars in the Galaxy, some 13 billion years old. Using data from the NASA Kepler/K2 mission, the international team has studied the resonant oscillations of stars using a technique called asteroseismology. These oscillations lead to miniscule changes or pulses in brightness, and are caused by sound trapped inside the stars. By measuring the tones in this ‘stellar music’, it is possible to determine the mass and age of individual stars. This discovery opens the door to using asteroseismology to study the very early history of our Galaxy. The K2 satellite observations are in close agreement with previous theoretical calculations of the properties of this type of stars, making the astronomers confident that their star models are close to being correct - that 'scales', 'yardsticks' and other tools for measuring the stars have the right calibrations, so to speak. All of the three quoted authors are also closely affiliated to the Stellar Astrophysics Centre at Aarhus University. At Stellar Astrophysics Centre, co-author Karsten Brogaard adds: "The Aarhus-based part of the group, participating with a large number of researchers to the paper, has mainly contributed with the major part of the analysis, plus the original idea to do the study, application for funding for the K2 observations and gathering of the whole group to begin with. We are very happy to see our collective efforts succeed." The paper is entitled: ‘Detection of solar-like oscillations in relics of the Milky Way: asteroseismology of K giants in M4 using data from the NASA K2 mission’ and is published by the Royal Astronomical Society in Monthly Notices. It can be found here.